Blueberry Recipes | "Il faut goûter"
1. 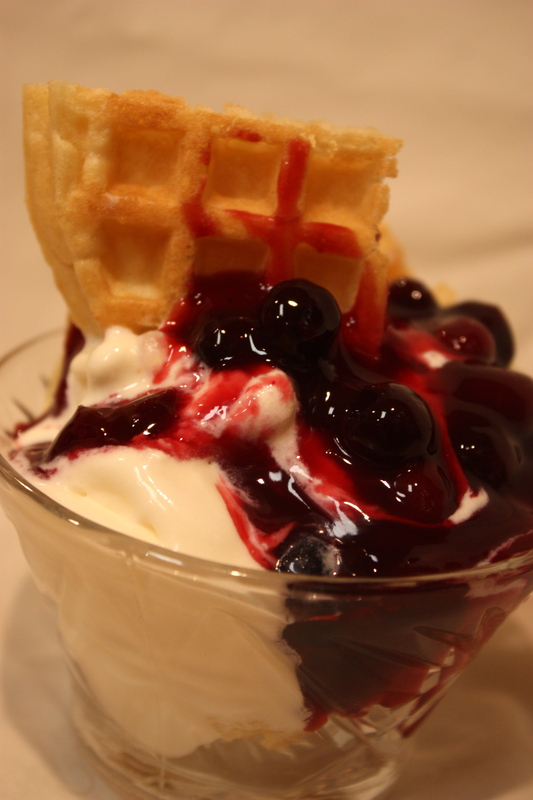 Here’s a family favorite dessert that is simple and simply delicious: waffles and ice cream with homemade blueberry sauce. Yup! I’ve made this with homemade Belgian waffles before, but we actually prefer the store-bought ones because they’re thin and bake up crispy! –In a saucepan over medium heat, combine the blueberries, 1/4 cup of water, orange juice, and sugar. Stir gently, and bring to a boil.– In a cup or small bowl, mix together the cornstarch and 1/4 cup cold water. Gently stir the cornstarch mixture into the boiling blueberries so as not to mash the berries. (It will start to thicken immediately). Turn heat to medium and simmer gently until thick enough to coat the back of a metal spoon, 3 to 4 minutes. Remove from heat and stir in the almond extract and cinnamon, if using. Thin the sauce with water if it is too thick for your liking. *Play around with extracts and cinnamon–depends on what you’re in the mood for! I’ve lately been making this with almond extract and no cinnamon. Muddle the berries and mint in the bottom of a cocktail shaker or glass with a lid (I use a Mason jar). 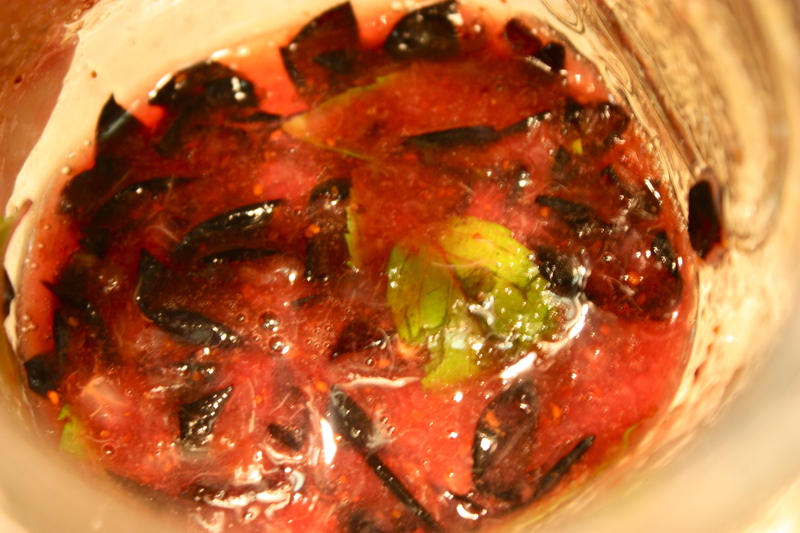 This mashes the berries and releases oils from the mint leaves :). Add the limoncello and ice, and give the mixture a few brisk shakes. Pour into the serving glass–the mixture should fill about half the glass. Top off with club soda (about equal to the amount of the blueberry-mint-limoncello mixture) and stir. 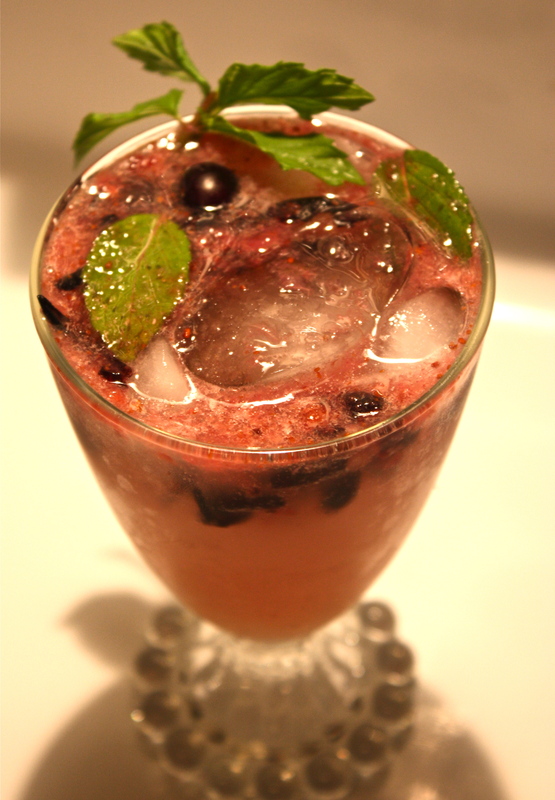 Garnish with a few whole blueberries and a sprig of mint! 3. 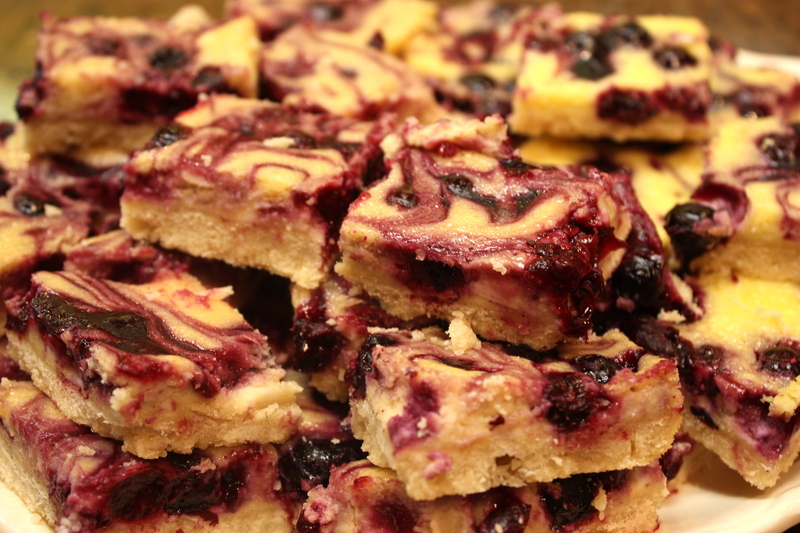 I adapted this recipe for Blueberry Cheesecake Bars from bakedbree.com–click on the link and check out her recipe, because she has great photos of the process. The only things I changed when I made these were 1) for the first batch I used lime zest instead of orange, and 2) for the second batch I added 1/2 teaspoon of black raspberry jam and 1/8 teaspoon of ground culinary lavender buds to the cheesecake filling, and I left out the zest and vanilla. Blueberry-Lavender Cheesecake Bars...and in the back--Blueberry Cheesecake Bars with a hint of Lime. Yum. Put the sugar, cornstarch, orange juice, and blueberries in a small saucepan. Cook over medium heat until it has thickened and begun to bubble. Take off the heat and set aside. For the crust, mix the flour, powdered sugar, and butter in a stand mixer until well-combined. It will be crumbly. Press into a foil or parchment lined 9×13 pan (or slightly smaller pan if you want thicker bars). Bake for 20 minutes in a preheated 350 degree oven. While the crust is cooking, cream together the cream cheese and sugar. Add the flour. Add the eggs, vanilla, and zest. Mix until smooth. Pour the cream cheese mixture over the baked crust. Spoon the reserved blueberries over the cream cheese mixture. Take a knife and swirl the blueberries throughout the cream cheese. Put the pan back into the 350 degree oven and bake for another 20-25 minutes or until the bars are set (not jiggly when you shake the pan). Let the pan cool on a rack, then put the bars into the fridge for at least 1 hour before serving. Cut into squares and dust with powdered sugar if desired. 4. I recently made this Blueberry Buckle from Rufus’ Food and Spirits Guide. It was great with ice cream! He’s always sharing excellent recipes and photos in his blog–check it out! This entry was posted in Uncategorized and tagged blueberry cheesecake, blueberry recipes, blueberry sauce, limoncello spritzer by needtotaste. Bookmark the permalink. I love this entire post, not just because of the nice shoutout thanks by the way. That drink sounds wonderful. I always have limoncello on hand. Also blueberries, waffles and ice cream, genius. All the above recipes WONDERFUL. Especially the blueberry sauce over waffles and ice cream. DAMN these look good will have to try them for sure. I’m coming to see you and Linda/Mom soon and hopefully I can help inspire a new blog post. LOve you and YouR FooD PaSsiOn! Love you Lacey. Come, let’s cook something. In fact, let’s decorate a cake–remember when we did that? …A New Mexico cake!